Thanksgiving Day back home in Charleston, South Carolina signals that it is time to plant the sweet peas. While my grandmother Faye and Aunt Willow and Aunt Alba work their magic in the kitchen (and argue on the correct way to prepare cornbread stuffing,) they would send me out to our vegetable garden with a small sack of peas that had been soaking in water overnight. Now that I'm living farther north and tending the garden for the First Lady of the United States (or FLOTUS as the press likes to call her), the cool season crops are grown and are ready to go straight from the garden to the Thanksgiving Day table. There will be no Thanksgiving afternoon planting of sweet peas at the White House. Although I'm still having to get used to living in a town where the summer and fall seasons feel shorter, I can't get over the depth of colors all around me right now. Fall is a spectacular time of year in our nation's capital! As the temperatures turn colder, the flowers burst forth in warm shades of reds, oranges, and dark yellows. I have to admit, however, that I was worried I'd be twiddling my thumbs when the temperatures dipped below freezing. By Thanksgiving, the Fall Harvest celebration is already a distant memory. I'd snapped this picture shortly before the October event (below). Notice the roped off area for the press to the right...set up next to the honey bee hive. I didn't pick that location. I'm sure it wasn't an intentional placement. No one at the White House would dare do that to our honored members of the press. Luckily, no one was stung. With our friends at the USDA (United States Department of Agriculture), my winter vegetable garden will be as busy as any other season. The White House is now all set to harvest vegetables year round with the help of hoop houses! 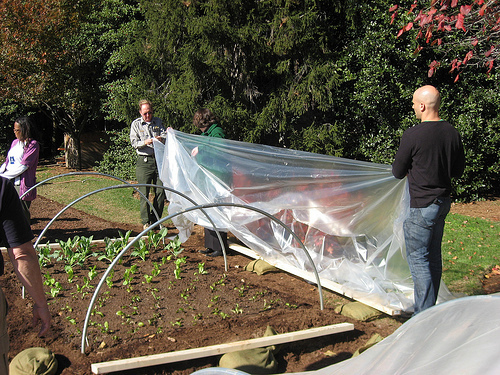 Hoop houses are inexpensive plastic covers stretched over a series of metal bars set in a row over the gardening bed. The sun warms the ground during the day. The fabric then traps the heat inside the hoop house and keeps the plants from freezing overnight. As we head into the holiday season, the gardening staff has been working hard to prepare the beds for a winter garden. We will soon plant spinach, lettuce, carrots, mustard greens, chard, and cabbage in our hoop houses. I've heard that winter spinach can be especially sweet. Because sugar acts like a natural antifreeze for the spinach plant, it'll produce extra amounts of it when the weather gets cold to protect from frost and freezing. I can't wait to sample the wonderful winter dishes the chefs have planned for the White House. I hope they save a small bite for me! Now that the garden is ready to go, I wonder what I should make for my first Thanksgiving Day dinner away from my family. Do you have any quick and easy (and safe) recipe suggestions for me? Interesting info about spinach, one of my favorite veggies. I know turkey will be on your menu and no matter how you roast it, it's a winner. Hope you enjoy your day! Honey child, you know that I love you and believe you can do almost anything. But heed me on this one. Get yourself out of that kitchen and to a restaurant. I don't want to hear on the TV how you burned the entire neighborhood down trying to fry a turkey.